Tuesday, the 24th of May, 14 Geo. III. 1774. This House being deeply impressed with Apprehension of the great Dangers to be derived to British America, from the hostile Invasion of the City of Boston, in our Sister Colony of Massachusetts Bay, whose Commerce and Harbour are on the 1st Day of June next to be stopped by an armed Force, deem it highly necessary that the said first Day of June be set apart by the Members of this House as a Day of Fasting, Humiliation, and Prayer, devoutly to implore the divine Interposition for averting the heavy Calamity, which threatens Destruction to our civil Rights, and the Evils of civil War; to give us one Heart and one Mind firmly to oppose, by all just and proper Means, every Injury to American Rights, and that the Minds of his Majesty and his Parliament may be inspired from above with Wisdom, Moderation, and Justice, to remove from the loyal People of America all Cause of Danger from a continued Pursuit of Measures pregnant with their Ruin. Ordered, therefore, that the Members of this House do attend in their Places at the Hour of ten in the Forenoon, on the said 1st Day of June next, in Order to proceed with the Speaker and the Mace to the Church in this City for the Purposes aforesaid; and that the Reverend Mr. Price be appointed to read Prayers, and the Reverend Mr. Gwatkin to preach a Sermon suitable to the Occasion. Ordered, that this Order be forthwith printed and published. 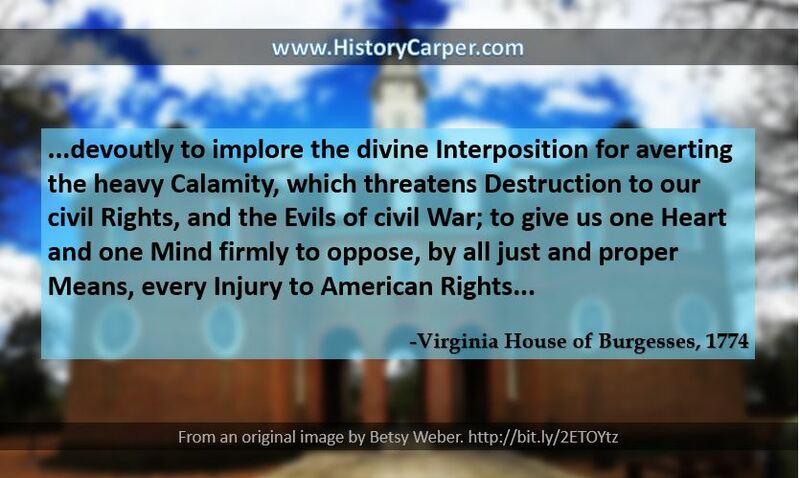 By the House of Burgesses. George Wythe, C. H. B.